Knightsen (formerly Knightsen Station) is a census-designated place (CDP) in Contra Costa County, California, in the United States. As of the 2010 census, the CDP population was 1,568, up from 861 reported in the 2000 census. 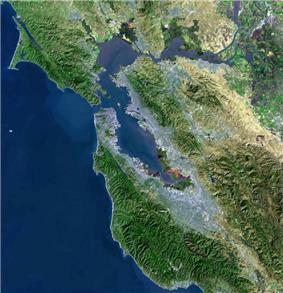 According to the United States Census Bureau, the CDP has a total area of 8.5 square miles (22 km2), 99% of it land. The population was spread out with 383 people (24.4%) under the age of 18, 138 people (8.8%) aged 18 to 24, 328 people (20.9%) aged 25 to 44, 508 people (32.4%) aged 45 to 64, and 211 people (13.5%) who were 65 years of age or older. The median age was 42.6 years. For every 100 females there were 107.7 males. For every 100 females age 18 and over, there were 106.8 males. There were 582 housing units at an average density of 68.8 per square mile (26.6/km²), of which 389 (73.3%) were owner-occupied, and 142 (26.7%) were occupied by renters. The homeowner vacancy rate was 2.5%; the rental vacancy rate was 2.1%. 1,176 people (75.0% of the population) lived in owner-occupied housing units and 392 people (25.0%) lived in rental housing units. As of the census of 2000, there were 861 people, 281 households, and 214 families residing in the CDP. The population density was 171.7 people per square mile (66.4/km²). There were 289 housing units at an average density of 57.6 per square mile (22.3/km²). The racial makeup of the CDP was 75.96% White, 0.12% Black or African American, 1.39% Native American, 0.23% Asian, 0.70% Pacific Islander, 12.54% from other races, and 9.06% from two or more races. 26.48% of the population were Hispanic or Latino of any race. There were 281 households out of which 32.4% had children under the age of 18 living with them, 63.7% were married couples living together, 7.1% had a female householder with no husband present, and 23.8% were non-families. 17.1% of all households were made up of individuals and 8.9% had someone living alone who was 65 years of age or older. The average household size was 3.04 and the average family size was 3.42. In the CDP the population was spread out with 27.4% under the age of 18, 7.1% from 18 to 24, 27.3% from 25 to 44, 26.6% from 45 to 64, and 11.6% who were 65 years of age or older. The median age was 39 years. For every 100 females there were 97.9 males. For every 100 females age 18 and over, there were 101.6 males. The median income for a household in the CDP was $58,929, and the median income for a family was $64,643. Males had a median income of $48,500 versus $32,708 for females. The per capita income for the CDP was $22,191. About 7.3% of families and 8.7% of the population were below the poverty line, including 5.3% of those under age 18 and 19.8% of those age 65 or over. ^ "Senators". State of California. Retrieved March 30, 2013. ^ "Members Assembly". State of California. Retrieved March 30, 2013. ^ "California's 9th Congressional District - Representatives & District Map". Civic Impulse, LLC. Retrieved March 9, 2013. ^ "2010 Census Interactive Population Search: CA - Knightsen CDP". U.S. Census Bureau. Retrieved July 12, 2014. ^ Durham, David L. (1998). California's Geographic Names: A Gazetteer of Historic and Modern Names of the State. Clovis, Calif.: Word Dancer Press. p. 648. The first post office in Knightsen was founded in 1900. Knightsen was founded in 1898 when it became a stop for the Atchison Topeka and Santa Fe Railroad. Knightsen has primarily been a farming community, growing such foods as almonds, walnuts, sunflower seeds, etc. It still contains a few U-pick vegetable/fruit stands. Knightsen now is home to many horse ranches. .Oakley The community is worried about urban sprawl from expanding development in neighboring  in California.4-H Club Knightsen has the oldest chapter of the  The town's name is a portmanteau of his last name and his wife Christina Christensen.